Naturally infused with Basil our Cotswold Gold infusions are available in 3 sizes. With a characteristic Italian aroma, our basil infusion can be enjoyed in a variety of ways. 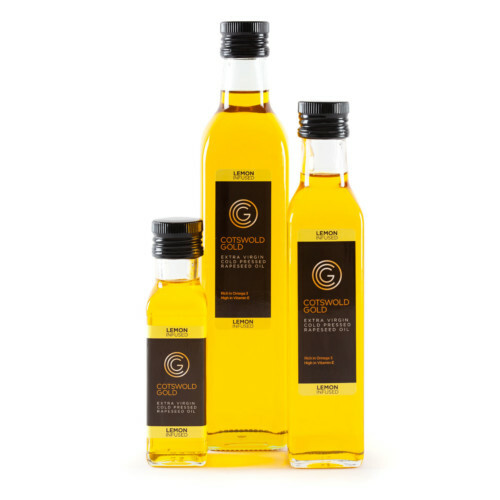 Cotswold Gold Rapeseed Oil Infusions – Basil has an initial subtle peppery flavour. Once cooked the taste then evolves into a slightly sweet, aromatic flavour. Our Basil infusion can be used in a variety of ways. We hope you enjoy! Basil pairs exquisitely well with lemon, tomato and garlic. Sweet basil is an essential ingredient in Italian and Mediterranean cuisine. Delicious when added to pasta, pizza, creamy sauces, dressings, soups and salads. Adds depth of flavour to meats such as chicken and beef. It also pairs extremely well with other herbs such as chives, dill, oregano, rosemary, thyme.